Understanding the client’s business and what the key stakeholders want is an essential step in selling web-2-print. The diagram below shows the drivers for the various roles within the SuperSuds Cleaning Franchise*. Identifying the different drivers for the various roles within an organisation means your pitch can be adapted accordingly, depending on who you’re pitching to. 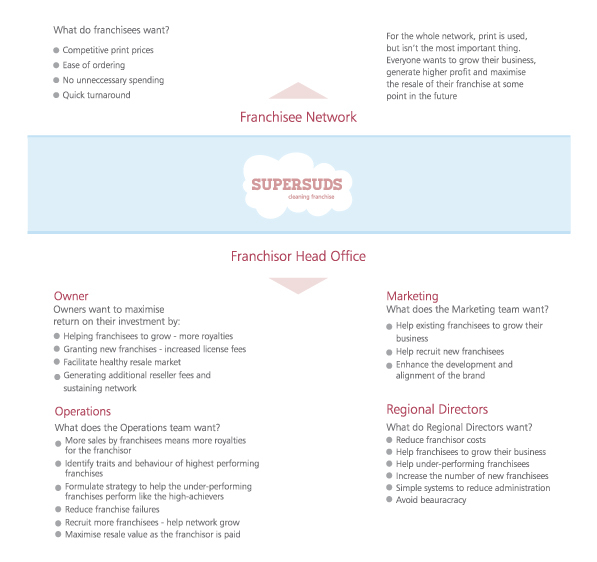 *Supersuds Cleaning is a fictitious franchise we have created to illustrate some of our points.